Color and cut out the templates. Glue on the straps that will wrap around the head onto the main part of the helmet. Next fold the tip of the side pieces. Glue them onto the main part of the helmet. Right next to were you glued on the straps. Glue the nose piece onto the main part of the helmet. Do this by adding a small amount of glue at first to the back of the nosepiece. Have the child place the main part of the helmet on his face (in the position it will go), then center the nose piece and stick it onto the helmet. Add more glue if necessary. Finally to hold the straps together you could either use Velcro, or you can use paper clips to hold it in place then add glue. I have included the word SALVATION in case you want to add it onto the helmet. 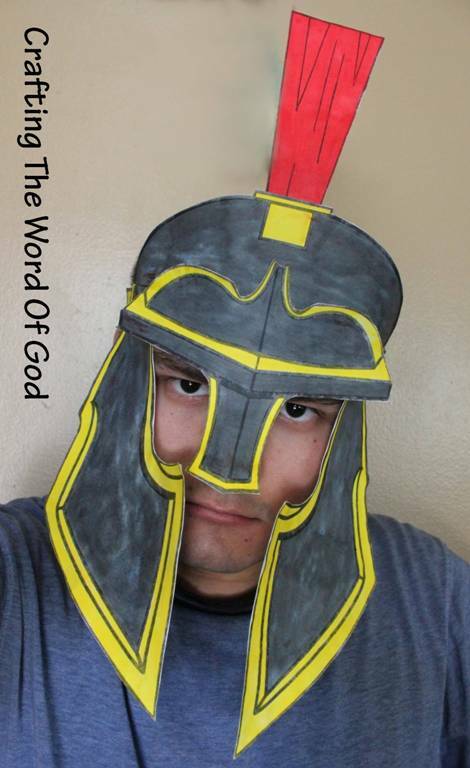 This entry was posted in Armor Of God, Bible Crafts, NT Crafts and tagged armor, armor of God, bible crafts, craft, crafts, God, helmet, helmet of salvation, salvation.